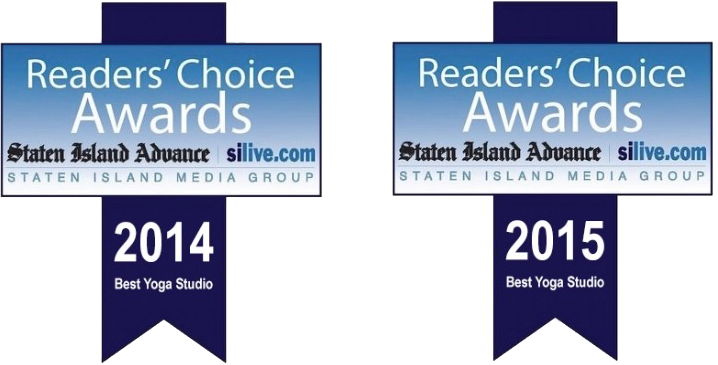 We the ONLY Power Yoga Center on Staten Island and is the first Baptiste Affiliate Studio in NYC. All classes are open to ALL LEVELS and are led by a team of teachers trained in the Baptiste Power Yoga methodology. The Baptiste Power Vinyasa style of yoga is a sequence of postures or asanas, linking breath and movement. We flow through the series in a 95 degree room to promote release of toxins and to provide fluidity and flexibility in the muscles and allow for space in clarity, concentration and precision. This practice is not about “perfectionism”, but proper alignment to find freedom in your practice. AN OPEN MIND & AN OPEN HEART is all you need to start. All classes are open to ALL LEVELS. Check the schedule for the time that’s right for you and take the first step in moving your life to a new place of discovery. IF NOT NOW, WHEN? The doors are open 30 minutes prior to the start of class and are locked once class begins – please respect other students & teachers and arrive on time. There are yoga mats & towels available to use for a small fee ($2 per mat/towel) and we offer yoga mats & towels for purchase from Jade Yoga. Director, Karen Torrone, is the ONLY Certified 500 Hour Baptiste Teacher in the area, a Certified Life Coach and the ONLY Certified Yoga Body Bootcamp Instructor in NY. Karen has trained over 500 hours with Baron Baptiste as well as many other teachers including Sri Dharma Mittra, Deborah Williamson, Seane Corn and Bryan Kest, as she believes that yoga is a lifelong journey of discovery both on and off the mat. She travels around the world sharing her love of yoga by leading workshops and retreats. Karen is a mentor with Africa Yoga Project and co-founder of Guyon Rescue, a not-for-profit 100% volunteer organization which began in the days following Hurricane Sandy. "I entered the 5 Boro Power Yoga doors on December 3, 2012, and that sparked the beginning of my journey. Although I struggled in every single pose and would collapse in my downward facing dog after 2 seconds, I knew I wanted to teach! So I kept showing up and practiced regularly! After the 40 day program, I wrote my first cookbook, “5 Boro Power Yoga Cookbook,” and completed Next Generation Kid’s Yoga Training, Baptiste Art of Assisting, Advanced Art of Assisting, Level 1, and Level 2. I love supporting, connecting and empowering others! Just being of service to others whether they’ve been practicing for years or struggling thru their first practice brings so much joy to my heart!" "In Fall 2014, I participated in my first 40 Days to a Personal Revolution program. It was through this program that I began to have a complete transformation of mind and body. As a result, I decided I wanted to be a part of the Baptiste community. From this manifestation, I attended and completed Baptiste Level 1 Journey Into Power training in February 2015 and Baptiste Art of Assisting training in March 2015. In April 2015, I became a floor assistant at 5 Boro Power Yoga and in May 2015 I began leading adult practices. In September 2015, I completed the 95 hour Baptiste Kids Yoga Teacher Training. With the opening of 5BPY Kids and More I have been given the opportunity to lead many children's classes varying in age. When leading classes, whether adults or children, I share my love, joy, and passion for this practice and community. I provide all students with support, acceptance, and encouragement for freedom of creation and expression." Lisa came to 5 Boro Power Yoga four years ago, looking for a way to lose some weight and get back into shape. Immediately hooked by Baron Baptiste’s philosophy of “Physicalness EmpowermentPossibility”, she began to attending classes nearly every day, and signing up for every possible workshop! After completing the 40 Days to a Personal Revolution program, Lisa was inspired to expand her knowledge of the Baptiste methodology by attending several immersion programs with Baron. After completing Level One in July of 2014 and Art of Assisting in December of that same year, Lisa joined the 5 Boro team, first as an assistant and then as a leader/teacher. In her classes Lisa strives to create an atmosphere of possibility. Students are encouraged to “come as they are” and to sweat, breathe and playfully experience the transformational power of Baptiste yoga. Shelby Caffrey is thrilled to be living her best life as a part of the 5 Boro Power Yoga community. She is on the path to becoming a Baptiste certified yoga instructor having attended Level 1, Level 2, Art of Assisting, Advanced Art of Assisting, and Level 3 this fall. Shelby believes that connection is an essential part of our lives and her classes are filled with powerful assists and fun, upbeat energy that will leave you in your power mind, body, and soul. Shelby comes from a versatile performing arts background - from musical theatre to Shakespeare with a BFA in theatre performance and voice from Marymount Manhattan College - and puts her passion for creativity into all of her yoga classes. Through her experience in 5 Boro's 40 Days to a Personal Revolution program, Shelby founded Little Jay Malas - custom malas and sacred jewelry for yogis, hippies, free spirits, and seekers of love and truth. Her jewelry and meditation beads have been featured around North America at festivals such as Wanderlust and Yoga Journal Live and have been headlined in Yoganonymous and on New Realities TV. Shelby celebrates the uniqueness and diversity in all of us and shares this love with all of her students both on and off the mat. Susan attended Urban Zen Integrative Therapy program 2008-2009 taught by various yoga teachers and functional medical professionals which included training to teach and administer alternative therapies to the hospital patient including a nutrition component. Upon completion she received a 500hr. yoga teacher training, level 2 reiki practitioner, understanding and use of therapeutic grade essential oils for issues such as pain, anxiety, nausea, insomnia, constipation, etc. Susan Farina, RN, UZIT: "I have been practicing now for 18 years in various teaching styles and have studied with a long list of teachers who have instilled in me the understanding of the science and the health benefits yoga has provided for thousands of years. I continue to do research on health/wellness, practice and gain knowledge from many alternative modalities and bring that to students. My Yoga Nidra training began with a personal practice for several years taught to me in the lineage of Swami Satyananda Saraswati. I then studied with teachers in Kerala, India from the Bihar School of Yoga to further gain knowledge and also studied with Amrit Desai for a 5day intensive in Rhode Island for certification. This meditation technique helped me with PTSD and now integrate it into all of my classes.Creatively using and combining therapeutic grade of essential oils with positive affirmations, moon cycle and or chakra focus, sound vibrational therapy through music and mantra (nada yoga) which is consciously focused to work on a specific energy center or ailment. I draw on my understanding of assimilation, the way the body works to heal itself and intuition as part of my planning and choosing of yoga postures (dynamic, held, and restorative) health beneficial breathing practices (pranayama) and end the class with a 30-45 minute Yoga Nidra (yogic sleep) in supported savasana."